Today is the first day of my kitchen challenge. I went early to Tampines Round Market and bought fresh salmon slices. Most of the ingredients for the Lemon Rice was also available but I just picked coriander leaves, curry leaves and lemon. I do not want my Lemon Rice to be too pungent like eating in an Indian restaurant, so I substituted turmeric powder for urad dahl and mustard seeds, and jasmine rice for basmati rice. The result? 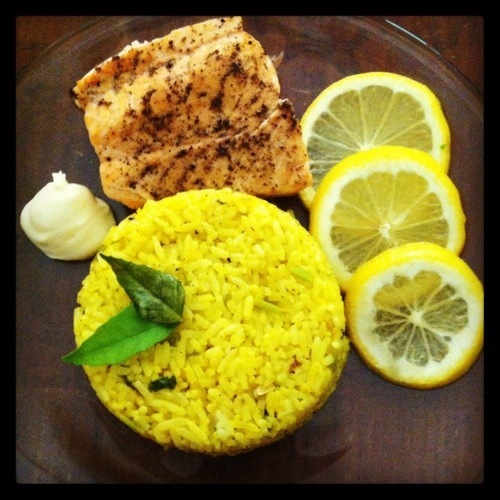 A delicious and kid-friendly Poached Salmon with Lemon Rice in less than an hour. A little trivia. 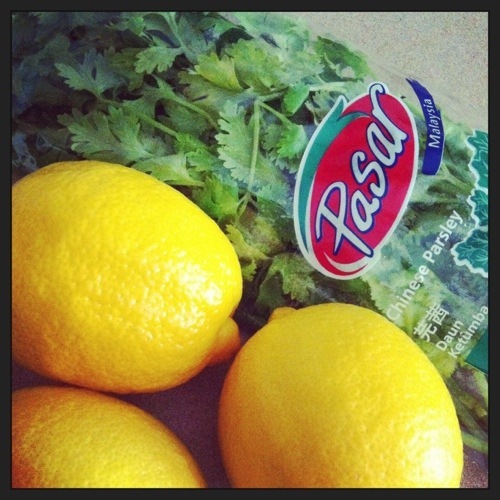 Did you know that Coriander, one of the spices in our Lemon Rice, is also known as Chinese Parsley? It actually has many names – dhania, cilantro and Mexican Parsley. The many names maybe because of how and where it is used. Mexicans use it in salsas, guacamoles and flavored rice. Indians use it in curries and sauces. Chinese and Thais use it for soups, salads and many other dishes. Filipinos also use it in soups and pancit (noodle). Coriander refers to the entire plant. The seeds, the leaves and the roots all have their specific use in cooking so it is best to check on the recipe on which one you need. Our Lemon Rice here uses the leaves. When buying coriander leaves make sure the color is very green and it has the aroma. If it has no aroma, it will yield no flavor when cooked and it is the same principle as dried or powdered coriander. You get the best from this spice when fresh and when added just before a dish is cooked, as it lessens its potency with heat. See you tomorrow for My Kitchen Challenge Day 2! Thanks Wendy! It is delicious and very easy to cook.